Over on io9, there is a collection of recent pictures showing how the European terrain still bears the scars of World War I. 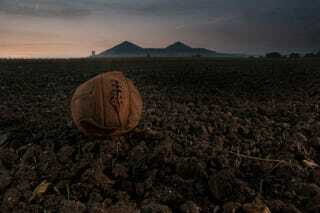 One such image is of this soccer ball, which was kicked into no man's land during a battle between British and German forces in Loos, France and which recently returned to the battlefield with photographer Michael St. Maur Sheil. I peered over the top. The air blazed with star-shells, and Loos in front stood out like a splendid dawn. A row of impassive faces, sleep-heavy they looked, lined our parapet; bayonets, silver-spired, stood up over the sandbags; the dark bays, the recessed dug-outs with their khaki-clad occupants dimly defined in the light of little candles took on fantastic shapes. From the North Sea to the Alps stretched a line of men who could, if they so desired, clasp, one another's hands all the way along. A joke which makes men laugh at Ypres at dawn may be told on sentry-go at Souchez by dusk, and the laugh which accompanies it ripples through the long, deep trenches... until it breaks itself like a summer wave against the traverse where England ends and France begins. Many of our men were asleep, and maybe dreaming. What were their dreams? . . . I could hear faint, indescribable rustlings as the winds loitered across the levels in front; a light shrapnel shell burst, and its smoke quivered in the radiant light of the star-shells. Showers and sparks fell from high up and died away as they fell. Like lives of men, I thought, and again that feeling of proximity to the enemy surged through me. A boy came along the trench carrying a football under his arm. "What are you going to do with that?" I asked. "It's some idea, this," he said with a laugh. "We're going to kick it across into the German trench." "It is some idea," I said. "What are our chances of victory in the game?" "The playing will tell," he answered. It was now grey day, hazy and moist, and the thick clouds of pale yellow smoke curled high in space and curtained the dawn off from the scene of war. The word was passed along. "London Irish lead on to assembly trench." The assembly trench was in front, and there the scaling ladders were placed against the parapet, ready steps to death, as someone remarked. I had a view of the men swarming up the ladders when I got there, their bayonets held in steady hands, and at a little distance off a football swinging by its whang from a bayonet standard. Ahead the clouds of smoke, sluggish low-lying fog, and fumes of bursting shells, thick in volume, receded towards the German trenches, and formed a striking background for the soldiers who were marching up a low slope towards the enemy's parapet, which the smoke still hid from view. There was no haste in the forward move, every step was taken with regimental precision, and twice on the way across the Irish boys halted for a moment to correct their alignment. Only at a point on the right there was some confusion and a little irregularity. Were the men wavering? No fear! The boys on the right were dribbling the elusive football towards the German trench. By the German barbed wire entanglements were the shambles of war. Here our men were seen by the enemy for the first time that e and roving that makes up the life of a soldier gone for ever. Here, too, I saw, bullet-riddled, against one morning. Up till then the foe had fired erratically through the oncoming curtain of smoke; but when the cloud cleared away, the attackers were seen advancing, picking their way through the wires which had been cut to little pieces by our bombardment. The Irish were now met with harrying rifle fire, deadly petrol bombs and hand grenades. Here I came across dead, dying and sorely wounded; lives maimed and finished, and all the romancof the spider webs known as chevaux de frise, a limp lump of pliable leather, the football which the boys had kicked across the field. What follows is the rest of io9's post.